A Dietitians Kitchen – March 2015. As I missed December, January AND February, I’m going to shine the light on some new favourites that have come into my kitchen over the past few months. I think the number one addition has been my new cookbook – Ottolenghi’s Plenty More – that is partially responsible for the foods and flavours combining on my dinner plate. This is a beautiful book expanding into the world of vegetables, grains and legumes. There is a focus on cooking methods (grilling, roasting, steaming, braising, mashing, baking), and delicious recipes calling for tahini. I highly recommend getting your hands on this one. Put your hands up if you’ve been getting figgy with it! I know I have and when you check out the #wednesdaybreakfastclub hashtag on Instagram, you’ll see that breakfast enthusiasts adore the fig. And at 25 calories and 2g of fibre per medium sized fig, can you blame us? My fav way to have fabulous figs? Top wholemeal crumpets with ricotta, sliced figs and a drizzle of maple syrup. Yeah baby. These sprouts have had such bad publicity over the years and you know what, they are not actually that bad. In fact, they frequent my shopping list. I’m a cruciferous vegetable girl (just in case the blog name wasn’t enough of a hint) so maybe that’s why I’ve adopted these beauties. Maybe I’m just odd. I like to steam them in the microwave and serve with a dash of soy sauce or a dollop of Dijon mustard. Okay, yes, I’m odd. The b sprout is an excellent source of Vitamin C and folate, so very good for helping keep our immune systems healthy and helping with cell division. Plus they also contain Vitamin E, Niacin & Vitamin K. So much good. 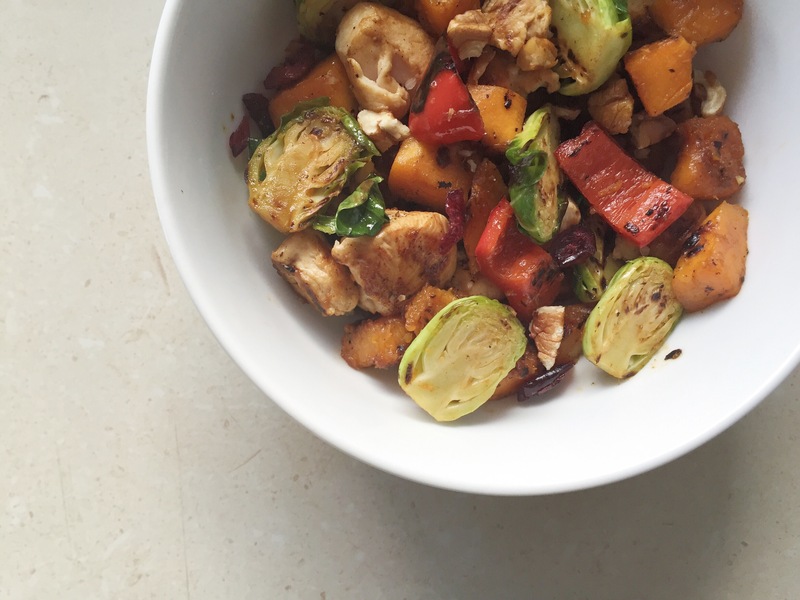 This month I tried an Orange-glazed pumpkin and Brussels sprouts recipe from Heartbeet Kitchen, and it was really good. Now, I’ve always considered pumpkin to be a winter vegetable. But as I attempted to classify it for a future guest post, I have realised something. I’ve been living a lie. Pumpkin have seeds, and therefore is in fact, a berry. How did I not realise this? The orange colour of pumpkin tells us that it’s an excellent source of Vitamin A, aka, helps us see in the dark. Plus it also contains the goodness of Vitamin C, Vitamin K, folate, niacin & dietary fibre. Anyway, I have unintentionally been using pumpkin quite a lot this month. You will see here, here, and here. Roasted, steamed and then in this ginger roasted pumpkin and quinoa salad from My Darling Lemon Thyme. Except, I used freekeh. Also, for the sweet tooth in all of us Jamie Oliver has an intriguing recipe for butternut pumpkin muffins with a mandarin & lavender frosting. Now, freekeh is a grain that is picked and roasted when the grain is young and green. The freekeh which I used was the Roasted Cracked Wholegrain Freekeh from Goodness Superfoods. It’s super simple to prepare – I just popped it in the rice cooker. Freekeh is a good source of fibre and has a low GI. Plus it’s packed full of other vitamins and minerals making it a highly nutritious grain to include in your diet. Up until this roast pumpkin, lentil & ricotta pie AND that hotcake, ricotta was not on my radar. But now, I just can’t get enough. There is the smooth and creamy ricotta which you buy in a tub from the dairy case. This goes deliciously well in a pie, spread on crumpets with figs, or in a quick pasta. And then there is fresh ricotta. That is the crumbly stuff that is sliced right in front of you at the deli. That’s a whole different experience. I first used it in these lemon & ricotta hotcakes (recipe courtesy of Lucky nuts), and then combined with pumpkin on a cauliflower pizza base and baked in this pumpkin & lentil salad. Pecans bring back memories of my undergraduate days. In particular one night sitting in Pie Face after a Harry Potter trivia night laughing at my American-accented housemate for her pronunciation of ‘pecan’. You probably had to be there. Sorry. Pecans, like all tree nuts, are a fabulous source of those healthy polyunsaturated and monounsaturated fatty acids. They have been shown to improve blood cholesterol by reducing the total and LDL ‘bad’ cholesterol levels, and prevent the oxidation of the LDL cholesterol which is responsible for plaque build up in our arteries. They are the only tree nut with a plant source of omega-3 ALA fatty acids which are good for our heart. Plus, one 30g serve of pecans provides 10% RDI for dietary fibre, 3g protein and some iron and zinc. They are great for a garnish on a salad, in a pecan pie, or you could mix it up and use them in the place of pine nuts in your pesto. If you have not hopped on board the herb train, please do. I used to flavour things with chilli flakes, sweet chilli sauce and mixed herbs. That’s about as flavoursome things got. Oh how I am glad times have changed. Hooray for herbs. Coriander. Mint. Curry Leaves. Basil. Dill. Parsley. Oregano. They just do so much for a dish, I call them heroic herbs, and you can read some of my herby kitchen adventures here . Last Saturday morning, I had the smashed avocado from Barry. Oh my goodness. There was mint, there was dill and there were chives. It was so good, and I do intend to replicate that breakfast at home in the near future. Actually, it seems that I’ve had a lot of things in my kitchen recently. There has been Soba Noodle, Oranges (FYI – Choc Jaffa cupcakes in March 2015 Healthy Food Guide – thumbs up) and who could forget the Peas. It’s been a busy couple of months. What’s new in your kitchen this month? Many people are curious about what a dietitian eats and has in their kitchen, fridge and pantry. Welcome to A Dietitians Kitchen! Whether it’s a recipe they can’t get enough of, a seasonal fruit or vegetable, exotic ingredient, new kitchen gadget or even the latest food trend, A Dietitian’s Kitchen will be a monthly post offering a glimpse into the kitchens of dietitians across the globe. < Inspiration or expert? – It’s time to put our health back in the right hands. It was a winner. Thank you! I’m yet to get figgy though… Perhaps you’ve inspired me!